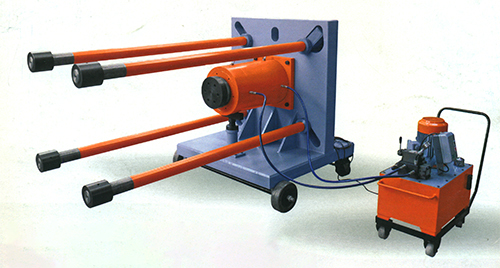 Hydraulic operated Cursher Pinion Gear puller is trolley mounted easily mobility in the sugar factory shop floor. It can be operated by hand pump OR by electrical power pack. The puller is user friendly which can be assembled easily and jammed pinion gear can be renoved precisely. • Heavy Duty Rugged construction for longer durability. • High Strength, Alloy Steel body of Hydraulic Cylinder for better Life. • Compact and easy to use. Double acting oil return. • Cylinder is honed to a surface finish of 0.4 microns. • Hard chrome plated ram to resist scoring and corrosion. • High pressure long life seals, Wiper to arrest ingress of foreign particles. • Relief Value in return position prevents accident against over pressure intensification. • Adequate gripping by grooved saddle. QCC with plastic dust cap. • Adjudtable slots and tie rods for job adaptability. • Wheels for easy mobility. Plot No. B/25, Sy. No. 329, Off. Majgaon Cross, Khanapur Road, Udyambag, Belgaum - 590 008. Karnataka, India.